Thanks to the innovative ducting system Comfort Air® you can heat several rooms, which are not necessarily connected, up to a maximum distance of 8 metres. Besides heating, this system can also filter the air, humidify and illuminate the environment. A true heat revolution, which applies both to pellet products as well as wood-burning products, stoves and fireplaces. 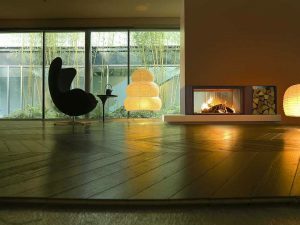 Unlike conventional systems that work with blown air, Comfort Air® works by extracting heat from the stove or fireplace, which allows the heat released into the environment to be increased by a maximum of 30%, making its distribution quicker, more uniform and allowing for significant savings in consumption. The Comfort Air® ducting system is one of the thinnest available on the market, hence hardly noticeable (60 or 100 mm section). This makes these products suitable for non-load bearing walls and partitions and limits the masonry work, which is often time-consuming and invasive. The vents can be placed freely, even at floor level, for balanced distribution of the air and unquestionable advantages in terms of design and aesthetics.